If you would like to offer downloadable files on your WordPress site but keep them protected from the general public by way of password protection, this article will bring you through the quick steps. We’re going to be using the Simple Download Monitor plugin for this. 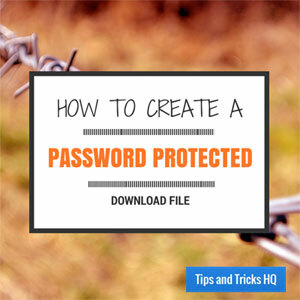 There is a password protection feature that is available with it to make this process very simple. Download the Simple Download Monitor Plugin from the plugin page of the WordPress repository. In the WordPress Dashboard menu, select Plugins, then click Add New. Search for “Simple Download Monitor” and locate the Simple Download Monitor Plugin in the list of results. Click the Install Now link, then Activate it. Click on Settings from the newly created Downloads menu in the Dashboard if you want to make changes to any of the settings. Click Downloads, then Add New from the left-hand menu. Enter the details for the file (title, description, thumbnail). In the Publish Settings area on the right side of the screen, click Edit next to Visibility. Optionally, enable the PHP Dispatch option of the download item (if you want to keep the file URL hidden). From here you will create a page or post and insert the download shortcode into the spot that you would like the download to display. Use the SDM Downloads button in the Visual Editor to quickly and easily insert the shortcode. Now share the page/post link and the password with your trusted groups. I love the plugin but I am having one difficulty. The dots are not visible in the password box because my default font is white. Can you guide me to a particular CSS code to change the font color to black for just the password boxes? @Olivier, can you share the URL of the page so I can take a look? This is actually really helpful. I didn’t think putting a password on a download was even possible. Thanks. unfortunately the plugin doesn’t work properly. I can arrange a download but it is impossible to set a password. Also I cannot upload an item for download – I have to upload it manually to the server and paste the link into the field. Is that caused by another plugin?